We all wear our Grendon badge with pride as it represents all of our Learning Behaviours. We call these Learning Behaviours and not values as we aim to demonstrate these on a day-day basis in all areas of school life. Each Friday in Celebration Assembly, teachers award one or two children in their class with a Learning Behaviour GRIT star. GRIT stars are awarded for consistently following Learning Behaviours during the week. 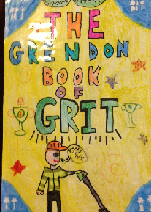 Children’s names are written in the book of GRIT and read out in assembly. Parents are ‘secretly’ invited to the assembly on the Wednesday of that week, to watch their child receive their GRIT star. Only Learning Behaviour GRIT stars can be worn at school. If you are invited to the assembly, why don’t you stay after dropping your children to school and have a tea/coffee with your friends at the Four Trees Restaurant and help support our FroGS too with their Lily-pad cafe which is open from 9-10am every Friday.